Last Week, one of the Nation media group’s publication, the Daily Metro carried a big banner headline reading FAREWELL. In the article that followed, the editorial team bid their readers goodbye citing the harsh economic times as the main excuse for the management of East Africa’s largest media house in discontinuing publication. Actually some analysts feel that the folding up of the Daily Metro was inevitable since it was founded for the sole purpose of countering Radio Africa’s Nairobi Star and forcing them out of publication. It is said that circulation marketers at the Nation felt that despite the fact that the Nairobi Star was targeted at a more specific audience it would eat up on the flag ship Daily Nation’s circulation considerably—if not immediately then definitely in the long term. Whether this is true or not, the fact remains that the Nation has remained at the top because of being highly sensitive to new entrants and possible competition. And the media house has never hesitated to play dirty whenever the need has arisen. The demise of the Daily Metro has less to do with the current financial downturn and more to do with the way things are run at the Nation. Insiders insist that the giant company is facing a very challenging financial time that has more to do with how quickly the media industry in Kenya has changed. For instance a few years ago Daily newspapers carried the vast majority of advertising spend in the country. Today radio is king. Now this change is significant here because Nation’s flagship and main cash cow is and has always been the Daily Nation newspaper. And although the media group has a radio station or two, there are a number of new kids on the block who have a bigger market share and understand the medium much better. Top on this list is Radio Africa whose Classic FM and Kiss FM lead the roost for English listeners. My insider information indicates that the decision makers at the media house have now woken up and are smelling the coffee so much so that they are already pursuing the next battle frontier which is the web and to a certain extent Cable TV and TV content. However this has come a little late. For years any new ideas or suggestions for improvements at Nation House would more often than not be met with the arrogant statement “but this is the Nation”—insinuating that the nation was invincible and would continue to do well without any new ideas. Now with dwindling revenues all round the past has finally caught up with arrogance and it was inevitable that the management would take a look at all titles still costing it cash looking for ways to stem the cash hemorrhage. Next on that list would be the EastAfrican a regional newspaper launched on the assumption that regional integration would have moved much faster than it has to date. This prestigious and excellent publication has never made a dime since inception. One of the reasons being it’s unnecessarily high overheads where huge bureau offices have been established in neighbouring Tanzania and Uganda where smaller leaner set-ups would have still produced the desired results more so in this age of the World Wide Web where communication costs have come down considerably. However shutting down the EastAfrican is not an option because it is the Aga Khan’s pet newspaper. The Aga Khan is the founder and major shareholder of the Nation Media group. Yet another title that is currently bleeding badly is the recently launched Business Daily. Mercifully the overheads for that one are pretty small and it can probably be sustained for some time to come. Interestingly even the Nation’s first ever title Taifa Leo is struggling but for reasons beyond anybody’s control. Apparently the new generation of Kenyans have shunned Kiswahili which was the most popular communication language in the country for many years. This is what led to the huge popularity of the KBC National Kiswahili service over the English General Service radio through the 60s, 70s and 80s. So where does the Nation media group make their money from? Actually there are only two star cash cows at the moment. Namely the flagship Daily Nation newspaper and the Nation courier service. Interestingly the launching of the courier service was a brilliant way to pay for the mounting costs of circulating the newspaper while earning extra revenue. Without these two cash cows the nation would be very much a struggling ship. Still increasing competition looms in the horizon coupled with some very serious strategic decisions made by the management in the run up to the 2007 general elections. Taking all this into consideration the daily metro may be only the first casualty in a list that will unfold in the weeks and months to come. On our last day of touring AKF projects in Nairobi, I woke up, packed my suitcases and then the group got onto the familiar shuttle bus to drive to Nation Media. We were leaving for the coastal town of Mombasa that evening and needed to be prepared. The bus ride to the heavily armed building was short. This was another visit to a site where taking photos wasn’t allowed. It’s too bad that I couldn’t take photos because words can’t do justice to the majesty of this building! It was seventeen floors, each with a metal detector and inspection stations with guards who wouldn’t let you through without confirmation your destination. It makes sense – the Nation Media Group is the largest of its kind, comprised of newspapers, television studios, radio stations and online media. Nation Media operates in three parts of East Africa and provides news, political information and a voice for the people, so residents in these parts are better informed. This operation is designed to counterbalance the information coming out of other media, including government owned sources. Nation Media started as a single newspaper in the late 1950s when it was purchased by AKFDN. It has now grown into an operation providing every kind of news delivery service you can imagine. Think of any major city newspaper office or media broadcast centre and you get the idea. Our guide, Sammi Mbau, led us around seven large floors of their operation. Large marble spiral stairs led us up each floor and as we made our way up these stairways we took ib pictograms on the walls which portrayed images akin to their mission and vision statements and other fundamental company information. I could have spent hours analyzing each pictogram. Key ideas that I gleamed from the images included striving for change, being efficient and remarkable, and being a great operation because of the staff they employ. As I took in these pictograms and spoke to some of the employees who described how they are cared for by their employer, I was reminded of AbeBooks. The Kenyan office employs over 1000 employees within the different sects of broadcasting, online media, radio, and newspapers. I felt inspired by their slogan which was ”To be the media for Africa, for Africa”. It was yet another way I could see commitment to change in many areas. After touring Nation Media we made our way to a working lunch at the AKF Headquarters where we learned about more projects in East Africa that the AKF is developing. AKF continues to operate many of the projects that it originally funded in different fields including health care (such as the hospital we visited), education (like the nursing education and preschools), environmental projects (like Frigoken and rural tree farming) and social/ cultural initiatives (like Nation Media). However, let me clear that there is definitely a distinction between the Agha Khan Development Network (AKDN) and the Agha Khan Foundation (AKF). The AKDN funds and is involved in more of the day to day operations of the businesses and projects, whereas then the AKF connects the services that are offered to the communities they support. The result is an inherently community run organization that enables local populations to gain access to services and resources that can help provide opportunities, change, and empowerment. We talked for a long time with Steve Mason and the CEO of AKF Kenya, Arif Neky. A key thing I took away from this discussion was the importance of providing culturally relevant aid. There is so much work and so many people with huge hearts that work for this organization that are being the change that they want to see each and everyday. I can’t stress the point enough in order to facilitate change, aid must be accompanied by teaching and empowerment. This entry was posted on Tuesday, August 25th, 2009 at 2:49 pm and is filed under AbeBooks, Megan Hamlet, World Partnership Walk. You can follow any responses to this entry through the RSS 2.0 feed. You can leave a response, or trackback from your own site. October 8, 2011 (JUBA) - The Kenyan-based Nation Media Group (NMG) is currently negotiating with The Citizen newspaper to buy shares, in deal that could see the company acquire major stakes in South’s Sudan’s leading English daily, Sudan Tribune understands. Founded in 1959, NMG has emerged as the largest independent media house in East and Central Africa, having reportedly been quoted on the Nairobi Stock Exchange since the early 1970s. Currently operating in Ugandan and Tanzania, the company has plans to expand to Rwanda and Burundi. There is something about Kenya that many of our people don't seem to fully appreciate. This is that we are a vibrant democracy surrounded by authoritarian states. Indeed I would say that some of the nations in our neighbourhood are "militaristic authoritarian states". Think about it for a minute. In Tanzania, it's only now for the first time that there is a genuine chance of the opposition parties wresting power from the Chama Cha Mapinduzi (CCM), which has ruled since independence. For all intents and purposes, Tanzania has been a single party state for the last 50 years. Uganda is ruled by a man for whom power came from the barrel of a gun, and though he was very popular and won the first few elections by massive landslides, his recent victories have involved strong-armed tactics which are anything but democratic. And, of course, the Ugandan constitution itself has been amended to allow for the perpetuation of Yoweri Museveni's rule. Somalia is a failed state, and has been so for two decades now. It is a country where the only thing that matters is how many armed militiamen a leader controls, not how many votes he can get in a free and fair election. South Sudan too is heading towards being a failed state. And in any case the two most important leaders there are men each of whom has his own military force, armed to the teeth, and ready to go into battle at his command. Ethiopia is a totally authoritarian country, and currently boasts a parliament without a single opposition MP. Rwanda is only a little less authoritarian - and here too, we have a president for whom power initially came only from the barrel of a gun. Eritrea is a police state in the fullest sense of the word. And in Burundi we have just seen a president force his way back to power, ignoring constitutional term limits. In DRC Congo we have had endless chaos almost since the dawn of their independence, which was actually a bit earlier than Kenya's independence. So you ask yourself this: how is it that in Kenya we have a thriving democracy which with all its mistakes still remains a democracy? People in leadership are constantly aware that every five years, the voters have the final say, and that they frustrate the hopes of ordinary Kenyans at their extreme peril. How did this happen? Well, as one who has witnessed at first hand much of Kenya's post-independence history, I attribute it to two key things that we now mostly take for granted; and to two men in particular. First and foremost, our founding President Jomo Kenyatta, a man I knew, respected and worked with closely not just in Kenya but even before independence when were both in the UK. Jomo Kenyatta, people often forget, was a supremely sophisticated man. He may have later found it politically expedient to dress in those so-called "traditional robes" - leopard skin capes and the like. But this was a man who spent decades in Europe: partially in self-imposed exile; partially in a lonely struggle agitating for Kenyan independence. Kenyatta understood in a way that few other Kenyans did, what it took to create a functioning democracy. He had observed such democracies in Europe in the post- war period close up. He fully appreciated that a democracy must allow for and accommodate free speech. For even at time when no one in the UK had any intention that the British empire should be dissolved, African nationalists like him were allowed to stand up in Hyde Park and argue strongly for the independence of their nations. Nobody harmed him. At most someone may have thrown a rotten egg or something like that, but he was not in any real danger just because he was arguing for freedom for black people in Kenya: something which most Europeans at that time considered to be simply an impossibility, as people like us were considered to be, intrinsically, incapable of ruling ourselves. So Kenyatta understood democracy, and he allowed democracy to thrive. Even when he fell out with his former close friend Jaramogi Oginga Odinga, thereafter, of those Luos leaders who made it into parliament a good number were appointed into the Cabinet. I know because I worked closely with many of them. And when some of these people went for elections they could as easily win or lose. Kenyatta didn't guarantee to bring them back into parliament and hence into his cabinet through rigging - which would have been much easier back then than it is now. He neither rigged in Luo leaders whom he liked to allow them to remain in office; nor did he rig out those he didn't like. So I am talking about a situation where despite our having a one-party state, which in those days was widely seen as necessary (if only for a time) in order to bring the country into a better quality of unity, there was true democracy in Kenya. Under Kenyatta there was freedom, including the freedom for people to elect the leaders they wanted. And freedom is something which once people get used to it, cannot easily be taken away from them. Kenyans are accustomed to political freedoms of the kind which Ethiopians, Eritreans, South Sudanese and many others can only dream of. But there is one other man who played an equally great role in ensuring that Kenya is what it is today and that was His Highness the Aga Khan. What Kenyatta did in in the political arena, in the establishing of political traditions and political norms of freedom (which often are more important even than the law itself) the Aga Khan did for the media. Those who know anything of the economics of newspapers will tell you that when you start one, you first lose money consistently for about ten years before you begin to make a profit. It requires a man with a deep purse and an even deeper understanding of the importance of a free media to accomplish this in a country which is just heading for independence. 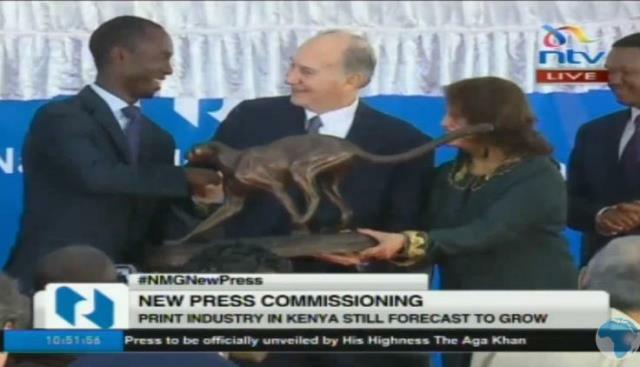 Now you have to appreciate the Aga Khan did not have to set up Nation media. He had many better and much safer investments available to him. I happen to know that when, in 1958 he set out to publish a newspaper which would "identify with and reflect the aspirations of the African majority in Kenya" it seemed like an act of supreme folly to many other potential investors. But the Aga Khan, purely on moral grounds and as a matter of principle, was determined that there must be a strong and independent media in Kenya. He knew that it was something the country would need and he devoted his financial resources to ensuring that this happened - even though back then nobody could have foreseen that his idea would grow into the Nairobi Stock Exchange blue-chip, which is now the Nation Media Group. Before that there had only been one daily newspaper which because it was essentially a monopoly, could more or less do what it wanted. That was The East African Standard (now known as The Standard). But once The Nation came into the arena; once there was competition; then you had a real media establishment. If one paper did not report something, the other one would, in the competition for circulation. That's the sort of thing you need in order to have a vibrant media sector. And the Aga Khan played an indispensable role in bringing this about. I look back with pride on the fact that I played a small role in this - by taking steps to block a hostile takeover of the Daily Nation by local political and business interests, who wanted to compel His Highness the Aga Khan to sell the paper to them. I knew very well that The Daily Nation would not remain a neutral and professionally run publication in their hands. Don't imagine that I consider the media in Kenya to be a pure and undiluted blessing. I myself have suffered a lot of vilification in the media. Things have been written about me which the editors knew very well at the time to be false but nonetheless had them published. Reports have been written which showed me in an extremely dubious light, and the editors did not at any point demand that their reporters call me and hear what my version was, of this story they were about to display prominently on their pages. Misrepresentations, vilification, spreading of lies - all these I have endured at the hands of the Kenyan media. But none of that has ever made me waver from my conviction that a free and independent media is absolutely central to our functioning as a democracy. But my bigger point in all this is the Aga Khan played a fundamental role in helping us establish a strong independent media establishment in Kenya. The media provides an essential component of our institutional checks and balances. And to me, when a president or deputy president says that the local newspapers are only useful for wrapping meat or fish, I know very well that they are, in reality, acknowledging their failed attempts to control the media. And for this I thank my old friend the Aga Khan. He did the country a great service in helping set up The Nation and its affiliated media products, thus introducing a competitive media establishment in Kenya which now has at least five powerful players: Nation Media itself; the RadioAfrica Group; The Standard Group; the MediaMax Group; and the Royal Media Group. So the long and the short of it, is that Kenya has a modern industrial-strength media establishment whereas our neighbours have what I would call "cottage industry" media establishments. Kenya has benefitted enormously from this strength in our media establishment. And for this the Aga Khan deserves a medal. Very interesting and insightful. Charles Njonjo is the former Attorney General of Kenya I believe. Kenyans love to complain about their newspapers. But that's a good thing because in many other countries in Africa they simply never read the papers. The Nation has the highest circulation of any newspaper on the continent outside South Africa partly because of Kenya's unique history when it comes to the private media. At independence, nearly all of the new governments in Africa shut down the privately owned press. Kenya and Senegal were among the few exceptions. Players in the Jomo Kenyatta government, especially members of the ruling elite who did not like the Nation's editorial line, tried to force the Aga Khan to sell the paper to them in the 1970s. 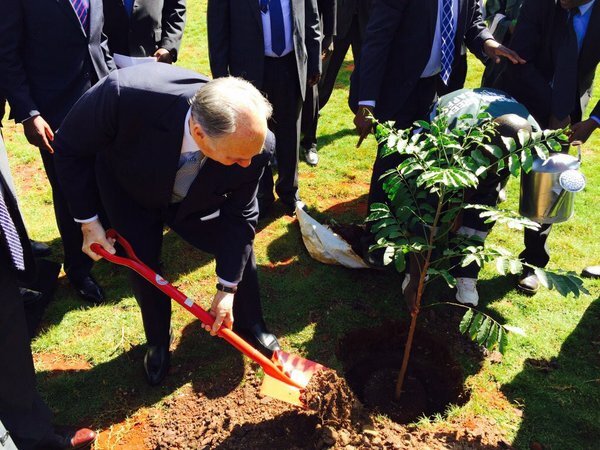 Fortunately for Kenya, the Aga Khan displayed a deft hand. He went behind their backs and directly to Mzee Kenyatta. He played the flattery card, as we learn from Gerry Loughran's The Birth of a Nation, a rich book which a smart publisher should bring out in soft copy to gain a larger audience. The Aga Khan told Mzee Kenyatta that he was respected around the world because, unlike others including his fellow giants such as Kwame Nkrumah, he and Leopold Senghor of Senegal were the only ones who were confident enough to tolerate a free press. If Kenyatta allowed his relative, Udi Gecaga, to buy the main newspaper in the country, he would lose the respect of those who called him the Burning Spear because of his confidence. That sealed the deal. Mzee picked up the phone and called the fellows who were lining up to buy the Nation and told them to drop the plan. That was an important moment because the fact the media remained in private hands -- and the presence of numerous journalists from London's Fleet Street among the early core of editors at both the Nation and the Standard -- meant that the print media in Kenya came to have a degree of professionalism higher than most on the continent. It's true the media has its shortcomings which it needs to address. But Kenya is the only country I know of where, for years, in survey after survey, the media has been named as the most trusted institution. That's not because the media is especially great. It is a commentary of the dysfunction of many other institutions in the country which means that many are left relying on the press to keep other segments of society in check. I will never forget the shock, on my first visit to the UK, of reading a survey which indicated that the police force in that country was the most trusted institution. People at festivals routinely posed for pictures with the officers, who were unarmed and asked them for directions. By contrast, just three weeks ago, a boy in Nairobi whose mother was in the salon wandered out and got lost. Well-wishers brought him to the newsroom rather than to the police station. The reporter Stella Cherono took care of the baby and put out messages on social media about him. NTV reported on it. Desperation set in around 9 pm because legally he had to be turned over to a police station for the night. Fortunately the mother was traced thanks to the TV message and she came over to reclaim him just in time. 11 March 2016 — Mawlana Hazar Imam is due to visit Kenya next week for the opening of a new press for the Nation Media Group. Hazar Imam’s visit to the country also relates more generally to the expanding scope of the work of the Aga Khan Development Network in the region. Founded by Mawlana Hazar Imam in 1959, the Nation Media Group is the largest independent media house in East and Central Africa. In addition to print publications such as the Daily Nation, it operates broadcast and digital media outlets in the region. In 2014 Nation Media announced plans for the installation of a new state-of-the-art printing press as part of a wider capital expenditure plan. The new press is expected to improve print quality, enhance newspaper pagination and increase colour capacity, in tandem with the Group’s expanding print business. Posted: Wed Mar 16, 2016 10:15 am Post subject: Nation Media Group’s new printing press. 17th March 2016, Mawlana Hazar will be inaugurating Nation Media Group’s new printing press. Tomorrow, Thursday 17th March 2016, Mawlana Hazar will be inaugurating Nation Media Group’s new printing press. With a capacity of printing 80,000 papers an hour, this state-of-the-art printing press is the first of its kind in Africa . The event will be streamed live on NTV and Q-tv stations starting around 8.40am with official commencement at 9.00am. When the Daily Nation was established in 1960, the newspaper business in Kenya was dominated by the colonial press, which did not represent the interests and aspirations of the local people. By staying true to its mission of helping the newly independent country discover its civic voice, the Nation emerged as the country’s most popular daily. One of the earliest components of what eventually came to be known as the Aga Khan Development Network resulted from Mawlana Hazar Imam's purchase in 1959 of a Kenyan Kiswahili daily called Taifa Leo. This was followed in the next year by the founding of the English language Daily Nation. Speaking in 2005 at the opening of the International Press Institute World Congress that was held in Kenya, Hazar Imam noted that, “At that time, many African nations had freshly emerged from colonial rule, and I believed that good journalism could play a critical role in their development.” He had strong support from young African politicians in the pursuit of this objective. The newspaper business in Kenya at that time was dominated by the colonial press, which did not represent the interests and aspirations of the local people. There were some very definite innovations that the Nation introduced into Kenya's mainstream English language press. While not neglecting international news, it brought national reporting to the fore. Its stories were presented in accessible writing and its format allowed for easy navigation through the contents. Unlike the broadsheet size of its main competitor, the East African Standard, the Nation adopted a smaller size which made it easier to handle. True to its mission of helping the newly independent country discover its civic voice, it also employed many African journalists. The paper was soon to be edited and managed by African staff. Readers noticed the difference in style and content, and the Nation emerged as the most popular daily in Kenya. However, reaching out to a mass readership did not mean that journalistic standards were compromised. Hazar Imam has been supportive of the freedom of the press, but has cautioned that it not be used to shield the media from a sense of social accountability. He has pointed out that the journalists who are underpaid and the media owners whose institutions are financially unstable can become vulnerable to corruption. “Our experience with the Nation newspapers in Kenya has demonstrated that journalistic improvement goes hand in hand with financial health,” noted Mawlana Hazar Imam at the Commonwealth Press Union Conference held in South Africa in 1996. Hazar Imam draws a clear distinction between the financial health of newspapers and profit-driven media which often are sensationalistic. The reduction of news to entertainment and exploitation of ethnic and religious differences in society can have very negative consequences. The Nation has made systematic investments in the training of its staff and upgrading of its facilities to ensure that it delivers good content in the most effective manner. It also has sought to upgrade the skills of its management and has instituted an in-house educational programme for journalists. The Aga Khan University will be establishing a Graduate School of Media and Communications in East Africa to enhance such training. One of the key features of the Nation has been its determination to remain at the forefront of media technology in order to deliver a good product. Hazar Imam noted that “The Nation was in the 1960s among the very first newspapers outside North America to embrace computerised typesetting.” By the mid-1990s, it was a leader in moving into multimedia technologies and making available its publications globally through the Internet. The newspaper has expanded into the Nation Media Group (NMG), the largest media company in the East African region. NMG has a suite of dailies and weeklies and runs radio and television stations in Kenya, Uganda and Tanzania. The Nation Digital Division is responsible for the Group's Internet and mobile telecommunications activities. NMG's shares are publicly traded on the Nairobi stock exchange and are owned by thousands of local shareholders. The Nation Media Group is also part of the Aga Khan Fund for Economic Development (AKFED), a unique development agency that operates on a commercial, for-profit basis, but which reinvests any profits it generates into further development work. AKFED is dedicated to promoting private initiatives and building economically sound enterprises in the developing world – and the Nation is a part of that story. At its fiftieth birthday, the Nation is the flagship of a very successful enterprise to enable Africans to have a say in their own societies' development. Founded in 1959 by Mawlana Hazar Imam, Nation Media Group is the largest private media house in East and Central Africa. Mawlana Hazar Imam will participate in the commissioning of a new state-of-the-art printing press for the Nation Media Group on Thursday, 17 March 2016. The event will be webcast at TheIsmaili.org/live starting around 9:45 AM EAT (Nairobi time). "The opening of an important new building is always a cause of celebration - and it is wonderful to know that so many people are celebrating this occasion with us. You may have heard about the man who was so excited when his friend opened a new building in his town that he sent a huge bouquet of flowers to celebrate that occasion. The only problem came when the bouquet arrived at the ceremony from the florist, and the card that was attached to the flowers read: "Rest in Peace." Well, the man who sent the flowers was pretty upset by this error - and he immediately called the florist to complain. But the florist calmed him down by saying, "Don't worry. Just think of it this way. Somewhere in this town some poor soul is being buried today under a sign that says: "May you thrive in your new location." Now, I don't know whether any cards got switched today at the floral shops of Nairobi. But I do want to make clear my wish for this new building. This will not be a place, I am sure, where anyone will ever want to "rest in peace." And my sincere wish for the Nation Group is that you will indeed, "thrive in your new location." It always seems to me that the point of any ceremony in this sometimes frantic age, is to take time out from our daily routines - to rise above our normal preoccupations. Ceremonies give us a rare chance to look backward and forward in time - back on the path we have already traveled and forward down the road to the future." 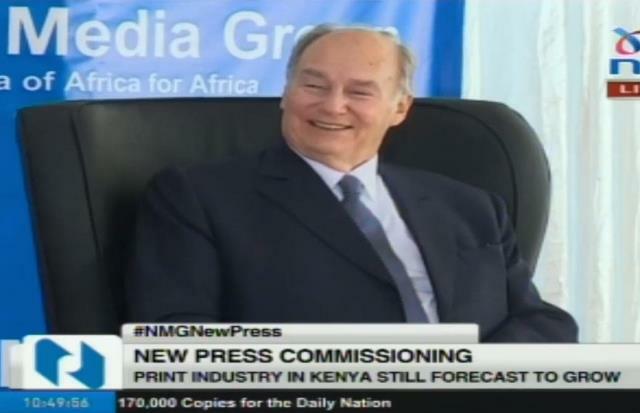 The Aga Khan has officially opened the Nation Media Group's new printing press on Mombasa Road. The press, which has a capacity to print 86,000 newspapers per hour, is a state-of-the-art facility intended to offer a range of options for advertisers and a fresh new look for readers. 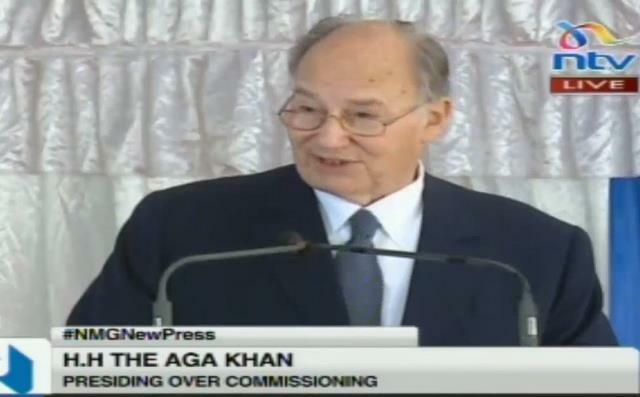 The Aga Khan hailed the new press as a major milestone for the company now in its 56th year in Kenya. It is a far cry from the technology in place when he founded the Nation Media Group more than five decades ago. "At a moment like this, I find myself thinking of the days when we started the Nation. That was five decades ago. It's hard to believe that much time has passed," he said. The Aga Khan also reminisced on his experience 56 years ago when the Nation Media Group was started.He also noted the explosion of new sources of information and media enabled by the growth in technology. "We live in a post-fact society. It's not that everybody feels entitled to their own opinion, and that's a good thing, but they also feel entitled to their own facts," the Aga Khan said. In such a world, he said, everyone should have a place to turn to for a constructive and objective source of information. He said the NMG has achieved his aim to have an independent media house. "Our goal was not to tell people what to think but to give them the information to help them think," he added. The event was also presided over by Information, Communication and Technology Cabinet Secretary Joe Mucheru. NMG Board chairman Wilfred Kiboro said the company would maintain constructive criticism of those in power as well as responsible reporting. "There will always be a need for good journalism and that's why we'll not sit and worry about when the last copy of the Daily Nation will roll off the press," said Mr Kiboro of the investment in print at a time the newspaper business is facing challenges across the globe. The press was built at a cost of Sh2 billion, a significant investment in Kenya and a testament to the group's commitment to the country. It is designed to put out, daily, thousands of copies of the Daily Nation, Business Daily, Taifa Leo and weekly, The EastAfrican. "Investing in technology and good journalism has been the DNA of this company from the very first," said Joe Muganda, the group CEO. "We will not waver in maintaining the high ethical standards expected of us. We'll stick to the high griund and I'm sure we'll come through," he added. In a speech read on his behalf by Mr Mucheru, President Kenyatta lauded the investment in Kenya and reiterated his commitment to media freedom in Kenya. QTV long Video now available! 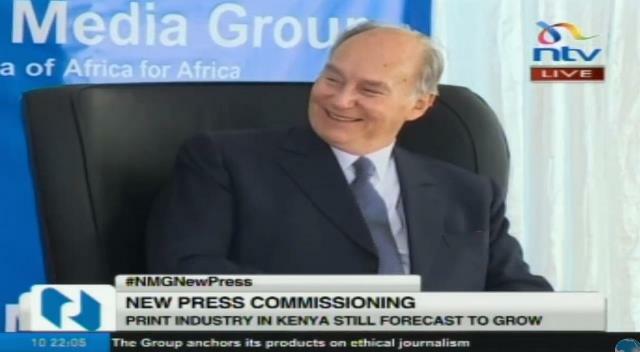 Remarks by His Highness the Aga Khan at the Ceremony Commissioning the new Printing Press for the Nation Media Group (Nairobi, Kenya). This is a great day for the Nation Media Group and for the media community in Kenya, as we take a major step forward in our efforts to serve this country and this region ever more effectively. What does a new printing press mean? Several things. It means more attractive newspapers. It means faster printing and earlier delivery. It means fewer delays and quicker responses when breaking news develops. It means better quality for our advertisers – more colour for example, for readers and advertisers alike. And, its construction has also meant more investment in the local economy. At a moment like this, I find myself thinking back to the days when we first launched the Nation – that was more than half a century ago. It’s hard to believe sometimes that it has been that long. And frankly, it is even harder to believe that so much time has passed since my childhood days in Kenya, and my continuing early visits to this country. Over that time, as you know, our Development Network has built a range of activities here – in education, in health care, commerce, tourism, finance, and other fields – that we hoped would help to improve the quality of life for the people of this country and this region. Over those many years a great deal has changed, of course. And the change has been particularly striking for the Nation Media Group. We have expanded by launching new newspapers like the East African and the Business Daily, by moving into the television and radio worlds, and by expanding into other countries in East Africa. And we have also moved decisively into on-line, computerised distribution of news and information. Our celebration today marks one other important transformation. We hear a lot about technological marvels these days. And the one we often hear the most about is how we can serve readers through their computer screens and mobile phones. But that’s not the full modernisation story. The new press we commission today is also a technological marvel. What it symbolises is our determination to use the very best technology we can find in any part of the world to do a better job for our customers – including the customers we serve on paper and through the printed word. When I think back to the founding of the Nation, and when I reflect on how much has changed and how far we have come, I think especially about the hopes and dreams with which we launched this company. Our goal then was to create a news medium that belonged to the whole of the nation of Kenya – and that of course is why we chose our company name. That dream moved ahead in a big way when we took the company to the public shareholding market, so that today a majority of Nation shares are owned by the general public of Kenya. Our additional central goal at the time of our founding was to create a news medium that would be truly independent: a place where the public could find a voice it could trust; an objective and thoughtful voice; a voice that would tell people what the facts are, as reliably as possible. Our goal was not to tell people what to think, but to give them reliable information so that they could think, more clearly, for themselves. To help us move down that challenging road we also created a formal set of editorial guidelines. These guidelines emerged as a great deal of discussion and debate took place internally and externally, and they were then endorsed at a meeting of our public shareholders. These guidelines represent a set of ethical and procedural standards – our honour code as independent journalists. Adhering to them is something we think of as a moral obligation. We continue to think and talk a great deal about those editorial guidelines. We had a major meeting just yesterday where we talked again, with our editors and with our Board of Directors, about how we could implement those standards most effectively. We all concluded that the role of a truly independent media house is more important now than ever – in Africa and all around the world. And we also acknowledged that fulfilling that independent role may be more difficult now than ever before. All over the world, the number of media voices is exploding – websites, bloggers and social media voices multiply every day. The result is often a wild mix of messages: good information and bad information, superficial impressions, fleeting images, and a good deal of confusion and conflict. And this is true all over the world. On top of that, this is also a time when public emotions and political sentiments are intensifying and even polarising – again, all over the world. The result, some people say, is that we live in a “post-fact” society. Yes, a post-fact society. It’s not just that everyone feels entitled to his or her own opinion – that’s a good thing. But the problem comes when people feel they are entitled to their own facts. What is true, too often, can then depend not on what actually happened, but on whose side you are. Our search for the truth can then become less important than our allegiance to a cause – an ideology, for example, or a political party, or a tribal or religious identity, or a pro-government or opposition outlook. And so publics all over the world can begin to fragment, and societies can drift into deadlock. In such a world, it is absolutely critical – more than ever – that the public should have somewhere to turn for reliable, balanced, objective and accurate information, as best as it can be discovered. No one, including the Nation Media Group, will ever be able to do that perfectly. But it is critically important that all of us should try. That may sound idealistic, but that is the reason that I founded the Nation a half century ago. That is also why we have also recently started a new Graduate School of Media and Communication here in Nairobi as part of the Aga Khan University. And it is why I wanted to be here today… to share in another milestone moment for the Nation Media Group. As we often do at milestone events in our personal lives as well as in our institutional lives, we think today about our dreams of the past and our hopes for the future. Milestone moments are times for celebration, and they are also times for rededication. As we commission this new press today, we are also rededicating ourselves to the ideals which gave birth to this company almost six decades ago, and that have since propelled it forward ever since. I am deeply pleased to be part of this moment, and to share in it with all of you. Thank you for being here, and thank you for your attention. Nairobi, 17 March 2016 — Mawlana Hazar Imam commissioned a state-of-the-art printing press for the Nation Media Group today, marking an important new milestone for the East African media house that he founded more than half a century ago. The new Manroland COLORMAN e:line is the fastest newspaper press in its class offering the highest quality of print and best-in-class automation. It has the ability to churn out up to 86 000 copies per hour — a significant leap from the 60 000 copies that the previous press could to produce — slashing production time by a massive 65 per cent for the Daily Nation, Taifa Leo, Business Daily and The EastAfrican weekly. Mawlana Hazar Imam watches as the newly commissioned Nation Media printing press commences operation. The commissioning ceremony was attended by numerous dignitaries, including the Cabinet Secretary for the Kenyan Ministry of Information, Communications and Technology, the Honourable Joe Mucheru and Dr Alfred Mutua, Governor of Machakos County — where the print facility is located — as well as leaders from the Nation Media Group and the Aga Khan Development Network. Following his remarks, Hazar Imam unveiled a plaque and was given a tour of the new press. “In such a world, it is absolutely critical – more than ever – that the public should have somewhere to turn for reliable, balanced, objective and accurate information,” said Mawlana Hazar Imam. Nation Media was founded with this purpose, said Hazar Imam. He also mentioned the Aga Khan University’s new Graduate School of Media and Communications, which will help advance the calibre of journalism throughout East Africa and the developing world. Mawlana Hazar Imam, together with leaders from the Nation Media Group, reviews the quality of the newspaper product produced by the new press. Until recently Godfrey Mwampembwa was one of Africa’s best known political cartoonists and one of the prized assets of Kenya’s Daily Nation newspaper. When he was suddenly dismissed from the paper late last year, many were left baffled. None more so than Mr Mwampembwa himself. Mr Mwampembwa, whose pen-name is Gado, learned of his fate from the paper’s editor-in-chief, Tom Mshindi, when he attempted to return early from sabbatical. “He said, ‘They have decided not to renew your contract’,” he told The Independent. I said, ‘Who are they?’ He couldn’t answer. 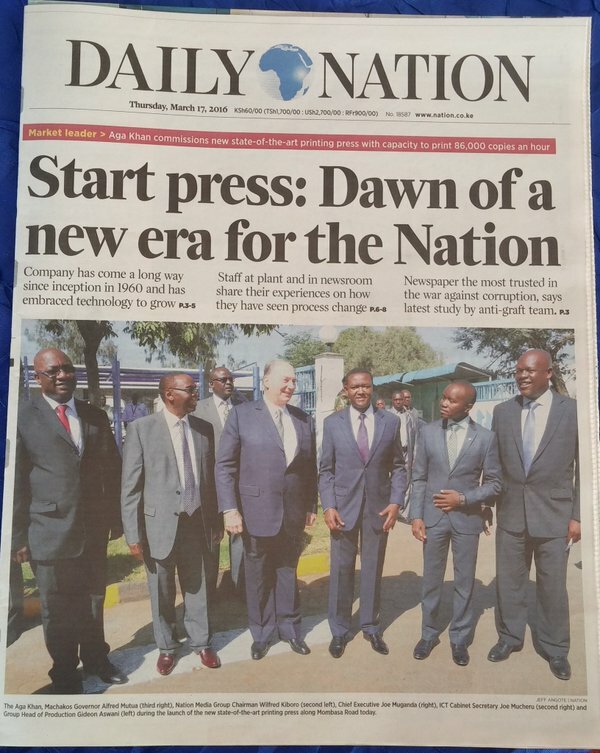 The Daily Nation, East Africa’s most influential newspaper, is owned by Prince Karim Aga Khan, a British businessman and the hereditary leader of the world’s 15 million Ismaili Shias, who confer him with “demi-god” status. He now stands accused of acquiescing to demands from the Kenyan government to gag the newspaper in a bid to protect his business interests in the country. The government is by far the country’s biggest advertiser and has the power to extend or rescind tax breaks. Prince Karim, whose father’s ex-wives included the actress Rita Hayworth, grew up in Nairobi and founded the Daily Nation in 1960, building it into the country’s foremost newspaper. But his vast business empire – including the Aga Khan hospital, the Serena hotel chain, insurers and a Kenyan bank – has long since dwarfed his media interests. As his empire has grown, so, too, have his vulnerabilities. In Uganda, President Yoweri Museveni’s antagonism to Prince Karim’s media interests led to a “taming” of his newspaper the Daily Monitor. Since November last year, a series of senior journalists have been purged from the Daily Nation as well as Gado, including a managing editor who wrote a searing New Year’s editorial attacking President Uhuru Kenyatta over his failure to tackle corruption. The cuts have left the industry reeling, with executives and journalists accusing the Aga Khan of scheming with the government as the country heads into tense elections next year. Many fear that the government is seeking to roll back hard-won freedoms. His troubles escalated with the publication of a cartoon pillorying Tanzania’s then-President, Jakaya Kikwete, and he was persuaded to take time off to allow tempers to cool, before he was cut loose. But if Gado’s departure had a sense of inevitability about it, the exit of other critical journalists did not. Denis Galava, a seasoned journalist, was the most senior editor at the paper the day he wrote his now infamous leader, a no-holds-barred open letter to the president that went viral on social media. Mr Galava was officially sacked for not following correct procedure. He is contesting his dismissal, claiming such formal procedures did not exist. Morale at the Daily Nation plummeted amid reports of a “hit list” of undesirable reporters and editors reportedly supplied to the Aga Khan at State House in December. Three journalists were made redundant this month in a sudden move that took their superiors by surprise. They included the Sunday Nation’s news editor and the investigations editor. Insiders privately suggest that coverage of massive corruption scandals, including allegations by the opposition that $1bn (£690m) raised by a eurobond sale remains unaccounted for, hit too close to home. Mr Galava’s affidavit purportedly includes emails from Mr Mshindi, the editor-in-chief, urging reporters to “go slow” on sensitive stories. Mr Mshindi said of his decision to sack Gado that “no contract is everlasting.” Accusations that management was caving in to government pressure were, he said, unfounded. “We have a very strong reputation of independence,” he said. Nevertheless, the Daily Nation is facing threats to a reputation built on coverage of events such as the state’s ruthless suppression of the pro-democracy Saba Saba riots in 1990, despite pressure from the Aga Khan’s representative to pull stories. That opened the floodgates for the critical coverage that helped usher in multiparty democracy. Under Mwai Kibaki, President between 2002 and 2013, Kenya’s media independence flourished, but freedoms were threatened anew when Mr Kenyatta took power in 2013. Mr Kenyatta, son of Kenya’s first post-independence leader, has had a combative relationship with the press, his alleged role in the 2007-08 post-election violence defining his candidacy. When an article displeases him, he is alleged to thump his desk with a fist and dispatch aides to harangue the writer. “It’s a government that is really, really sensitive to critical reporting, and it doesn’t hesitate to put on the screws,” said Patrick Gathara, a cartoonist and commentator. The government has attempted to push through draconian press and security laws, with the most anti-democratic provisions already struck out by the Supreme Court. Critical bloggers face harassment and detention. The Nation is a strong newspaper. It would not let its reputation be blackened by some irrational act of "Sacking" staff. I read this "sacking" matter few days ago. Why do they call it "sacking" when they themselves accept that Gado's contract came to term and was simply not renewed. I used to laugh when looking at Gado's caricatures but after sometimes got tired of it. I am not surprised his contract was not renewed. I am sure people need some changes and a new caricaturist would be welcome at this point. The sister company has had major disagreements with the Museveni government over its articles it published but that has not ended in "sacking" anyone. The integrity of the Aga Khan's newspaper is well known so much as the journalists are independent, even from taking instructions of the shareholders. The quality of reporting, though not perfect, has made the Nation, number one newspaper in the region. The only reason being the confidence of the public in the accuracy and historical integrity of the news in The Nation. The future-oriented newspaper printer Nation Media Group in Nairobi is convinced of the promising potential of the African newspaper industry and therefore decided to invest in a manroland web systems COLORMAN e:line at the end of 2013. On March 17, 2016, the inauguration celebration for the printhouse building was held, which was constructed on the existing printing grounds on Mombasa Road especially for the new, ultra-innovative COLORMAN e:line. Fifty-six years ago, His Highness The Aga Khan founded the Nation Media Group (NMG), the largest independent media company in East and Central Africa. Since then, the company has aimed to provide citizens with serious, reliable information allowing them to form their own opinions. His Highness The Aga Khan also emphasized the associated corporate policy in his speech at the inauguration, which he personally attended. For him and his company, the new manroland web systems newspaper printing system going into operation represents a special milestone. Every day, the Nation Media Group prints thousands of copies of the Daily Nation, Business Daily, and the Taifa Leo, as well as the weekly The EastAfrican. In the future, they will all be produced using the new COLORMAN e:line. On Thursday, March 17, 2016, the event celebrating the new COLORMAN e:line was held on the Nation Media printing grounds. 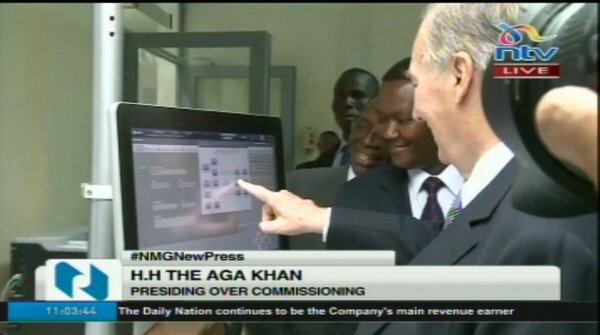 In the presence of His Highness The Aga Khan, the newspaper printing system was officially put into operation. High-ranking individuals from politics, including Dr. Alfred Mutua, Governor of Machakos County, and Nation Media Group CEO Joe Muganda as well as the Chairman of the Board Wilfred Kiboro were all present. manroland web systems was represented by project manager Dr. Ralf Schädlich as well as Wolfgang Hiesinger, project manager for newspaper printing systems, who both arrived from Germany. The entire event was broadcast on African television, including live interviews. In addition to a speech by His Highness The Aga Khan, the event was accompanied by different lectures. The highlight of the supporting program was the start-up of the COLORMAN e:line, initiated by His Highness The Aga Khan on the state-of-the-art manroland web systems control console. The new newspaper printing system can print up to 86,000 newspaper issues an hour, making it the fastest of its class. At the same time, the COLORMAN e:line in a 4-1 configuration convinces with top printing quality, outstanding automation, and a high degree of flexibility. “This is what we call future-proof,” states Wolfgang Hiesinger from manroland web systems. Gideon Aswani, Production Director at NMG, underscored the production time, reduced by a tremendous 65%, as a major advantage of the COLORMAN e:line. For Nation Media, this means being able to produce the same print run in two and a half hours, a venture that would have taken six hours before. Furthermore, the company has managed significant reductions in waste, saving them up to eight million Kenyan shilling annually. Nation Media is especially proud of the newly purchased and exclusive functionalities offered by the COLORMAN e:line, including the production of special advertising formats such as booklets, super panoramas, Flying Pages, half covers, and oversized advertising spaces. This unique selling point also reinforces the excellent market position of the Nation Media Group in the African newspaper industry. With this support, a significant increase in the print run has already been achieved since the COLORMAN e:line went into operation. His Highness The Aga Khan has given special recognition to the COLORMAN e:line, referring to it as a “technological marvel”. Today, Nation Media is already considering expanding its newspaper printing system to include a sixth printing tower to exhaust the space available in the newly erected printhouse building and increase productivity. In addition, last year, NMG concluded a ten-year service contract with manroland web systems, which includes employee training, process optimization, maintenance, and possible repairs, among other key features. Both companies expect a long, successful business relationship. “After the war, Frank moved to Cape Town and his interest in printing meant a directorship in that business for many years before he returned to Southend-on-Sea (in Essex, England). He took up a job as a compositor with a local newspaper before emigrating to East Africa. Frank left England to take up a position with the Nation Newspaper in Nairobi. I believe he was a production manager and retired as Chairman for a company owned by the Aga Khan with whom he kept in touch until he died . Nation Media Group is the largest independent publisher and broadcaster in East Africa, but all is not well at this icon of free media in Africa, which is struggling to stay in business and to remain independent while doing so. By NJERI KIMANI. In recent weeks, Nation Media Group – one of the largest players in the media sphere in Kenya and East Africa – has gone on a firing spree, with more than 200 journalists losing their jobs. Founded in 1959 by the Aga Khan, even his deep pockets are struggling to keep the media house afloat in the digital era. On 30 June, management ruthlessly shut down Nation FM, QFM and Rwanda FM, and merged its QTV Swahili Station with NTV, sending workers home. In a statement, the group claimed that this would rationalise its broadcasting division, helping it to secure an increasingly fragile business position. In the last two years, the company has fired more than 300 correspondents from its satellite bureaus including Nakuru, Kiambu and Mombasa. It is now heavily relying on interns, engaged for three months at a time, to supply news content. It is also pushing a convergence model across its publications, where outlets share reporters and editors. More than 10 reporters have subsequently quit. In another sign of rising cost pressures, NTV’s YouTube channel was recently suspended following repeated allegations of copyright infringement. “NTV Kenya has been terminated because we received multiple third-party claims of copyright infringement regarding material the user posted,” YouTube said in a statement posted on the blocked channel. Another blunder came in May, when a dummy version of the East African – the biggest regional paper – was published by mistake. On the front page, only the headlines were right, while the rest was just placeholder text. The humiliating mistake was blamed on under-staffing. “We have been following up with the dismissal of the journalist and many were given the one month notice as is required by law. We were also able to negotiate with the company on the retirement package for the ones who were our members and many went home satisfied,” he said. Odour claims that the company is now stronger than before as the restructuring is helping it retain the best of its talent. But Nation Media Group’s woes are not limited to the economic milieu. With free media coming under increased pressure in Kenya, the group has been accused of bowing to political influence. Last year, the company fired popular Kenyan political cartoonist Godfrey Mwapembwa, popularly known as Gado, after 23 years with the group. “They had always supported me despite some complaints from public officials. However, when the current President Uhuru Kenyatta and Deputy President William Ruto came to power in 2013, things changed. However, I cannot single out a caricature which led to my dismissal,” said Gado. He had often portrayed the two statesmen with balls and chains attached to their ankles, a practice which his editors advised him to discontinue. This January, another major scalp: Daily Nation editor Denis Galava was suspended and then sacked, allegedly for failing to follow due procedure in penning an editorial. But it just so happened that this editorial was critical of President Kenyatta, and Galava was under no doubt whatsoever that this was the real reason for his dismissal. “My view is that the editor is taking instructions from State House [the seat of the president], and is now hiding behind procedure,” Galava told the Daily Maverick at the time. Galava is now suing the Nation Media Group company for 425-million Kenyan shillings (R60-million). A current Nation Media Group employee, speaking on condition of anonymity, told Daily Maverick that it has become taboo to criticise the government. Summary: When we asked Nairobi’s Tazmin Jamal to write a short piece about the Nation Media, which was founded in the late 1950’s by His Highness the Aga Khan, she went the extra step to interview a key staff member at the newspaper’s head offices in Nairobi as well as approached numerous Nation readers to give their views on their favourite newspaper. We sincerely thank Tazmin for her great effort and enthusiasm. Her informative piece appears below under 3 sub-titles. — Ed. 65 participants of the Global Encounters program toured the New Nation Media Group Printing Press along Mombasa Road facilitated by several Aga Khan Development Network agencies as part of their learning experience in Kenya. Nation Media Group has dismissed speculations that the company may be up for sale. Speaking during an investor briefing on Wednesday, NMG chairman Wilfred Kiboro urged Kenyans to ignore the rumors on social media. During the Aga Khan’s recent visit to Kenya, there was heightened speculation that he would meet President Uhuru Kenyatta to discuss among other things, the sale of his media interests. Aga Khan is the principal shareholder of the Nation Media Group with other interests in the hospitality, banking and insurance sectors. However, Mr. Kiboro refuted the claims and instead urged the government to pay the media house Ksh. 700million owed to them. “What we can promise everybody here is we will report the truth,” he told the meeting at Stanley Hotel, Nairobi. The Nation Media Group (NMG) management has finally spoken about reports of the company being targeted for acquisition by the Kenyatta family. Speaking today at a staff communication meeting held at Nation Centre, acting CEO Stephen Gitagama said there were no plans by shareholders to sell off NMG, Kenya’s leading media house. East Africa’s largest media group-Nation Media Group has run into fresh challenges and is in the process of selling one of its print media outlets. Group Chairman Dr Wilfred Kiboro informed shareholders during the 55th annual general meeting (AGM) on Friday that the company would sell 51% stake in Mwananchi Communications Limited to a Tanzanian outfit. Mwananchi Communications Limited publishes Tanzania’s leading dailies including The Citizen, Mwananchi, The East African and Mwanaspoti. Kiboro cited the enactment of the Media Services Act that limits foreign ownership in a print media in Tanzania at 49 per cent, admitting that it “posed a challenge to the group”. “We continue to operate in an unpredictable and challenging regulatory environment across the region,”Kiboro said. Locally, the media group has also faced challenges that have led to loss of advertising revenue and viewership. On January 30 the government shut down transmission systems with NTV and KTN News being off-air until February 5 when they were restored. The media group has also come under stiff competition from rival media outlets such as The Standard, KTN and Citizen TV. Citizen TV owned by Royal Media Services recently raided NTV newsroom and poached key media personalities such as Nimrod Taabu, Jamila Mohamed among others with Larry Madowo ditching NTV for BBC. Those who resigned include George Kegoro, Muthoni Wanyeki, Gabriel Dolan, and Rasna Warah Maina Kiai, Gabrielle Lynch, Nic Cheeseman, and Kwamchetsi Makokha.